The Ruthenian Church as well as all of Eastern Orthodoxy celebrates the Feast of St Photios the Great, Patriarch of Constantinople today (unless you are on the Old Calendar of course!). 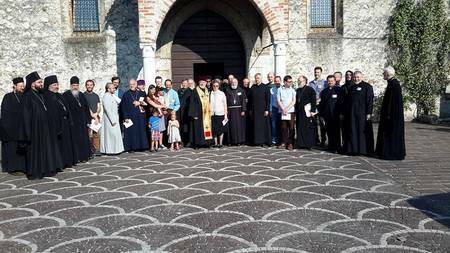 Congratulations to the Ruthenian Byzantine Catholic Church for its leadership in this regard. There can be no doubt but that St Photios is a Catholic and Orthodox Saint at once. He defended the orthodox doctrine of the Procession of the Holy Spirit and the universal Creed that admitted no further additions, including the "Filioque." He was reconciled with Pope John VIII who embraced him as an equal brother, having places two thrones of equal height, side by side, at Rome. Pope John VIII also said that he too regarded the Filioque as a heresy. There are two tablets with the Nicene Creed written on it in silver lettering, one in Greek, the other in Latin, at Rome - neither has the Filioque. May East and West become one again in Orthodoxy through the intercession of our Father among the Saints, Photios the Great, Pillar and Defender of Orthodoxy and the Catholic Church! May this come to pass through the power of the Holy Spirit, the Comforter, Who proceeds from the Father and Who rests on the Son! For those interested AND who can read Church Slavonic, here is a link that has the full Service to St Photios the Great, including his Akathist! Scroll down to the slavic "F" and that is where you'll find the link. Rejoice, O All Wise Photios! In addition, he is referred to as "Equal to the Apostles." And let's not forget that it was St Photios himself who sent Sts. Cyril and Methodius to be the Apostles to the Slavs! He is integrally related to our Church and kudos to the Ruthenian bishops for affirming public liturgical veneration of him! It was from St Photios' time that the Feast of the Holy Protection of the MOther of God became popular in Kyiv and elsewhere and it is today a Church-wide feast in all the East Slavic Churches. It was St Photios who brought out the Mantle of the MOther of God and dropped one end of it into the water - and this against the Rus' fleet that came up against Constantinople. Soon the waves became violent and many ships were destroyed. Askold and Dir of Rus' sued for peace and became Christians. Both were killed by Prince Oleh. St Olha the Great built churches above their graves, which was a form of local canonization. The Tomb of Blessed Mykola-Askold is a great national monument to this day in Kyiv. A blessed St. Photios day to you. Thanks for this very interesting information. He is also venerated on the traditional Armenian Church calendar. I trust the Armenian Catholics will return to their authentic tradition soon and follow suit. I know one Armenian Catholic who is doing so (and his family)! A blessed St. Photios day to you. Thanks for this very interesting information. He is also venerated on the traditional Armenian Church calendar. It has been said here that Saint Photios is in the "traditional Armenian Church calendar", which I take to mean that of the Armenian Apostolic Church (Orthodox). Elsewhere on this forum, I think I've read that there were people on Coptic calendars of a similar standing. What similar standing? The fact that these people came after the separation of the non-Chalcedonians and the Chalcedonians. How is it that the Oriental Orthodox Churches have on their calendars men and women post-schism, "other side"? Who are some of these folks, and why are they on our calendars? Not that I mind, but I'm wondering how this came about. I'm confused. It has been said here that Saint Photios is in the "traditional Armenian Church calendar", which I take to mean that of the Armenian Apostolic Church (Orthodox). Elsewhere on this forum, I think I've read that there were people on Coptic calendars of a similar standing. What similar standing? The fact that these people came after the separation of the non-Chalcedonians and the Chalcedonians. How is it that the Oriental Orthodox Churches have on their calendars men and women post-schism, "other side"? Who are some of these folks, and why are they on our calendars? Not that I mind, but I'm wondering how this came about. Good question, brother. I can't speak for the Coptic tradition but the Armenian Church continued to have relations, contacts and even coucils attemtpting reunion with the Chalcedonian Churches. I have some information on my "Articles" page about the large group within the Armenian Church, over the centuries, who worked for reconcilliation with the Chalcedonian Churches both of Elder and New Rome. Infact, I believe, our own Armenian Catholic Church, imperfect as it is, is the fruition of that movement started from the early days following Chalcedon. Obviously from looking at the Armenian tradition, an exchange was still taking place, after Chalcedon, b/t the Armenian Church and the West (remember Constantinople is WEST to us) . Not only this, Armenians had a large minority in New Rome. I forget how many, but something like a couple dozen Emperors of New Rome were Armenian and also a few Patriarch's of Constantinople. Which leads me to the final reason St. Photios is on our calendar... he was an Armenian, and a descendant of St. Gregory the Illuminator at that! I hope this helps in some way to answer your excellent question of what a Chalcedonian is doing on an non-Chalcedonian Church's calendar. Yes, indeed - Photios was of Armenian descent! There were others in New Rome and St Justinian the Great was actually a Slavic Emperor - "Upravda" and built the Cathedral of the Holy Wisdom in Constantinople. The Armenian was always "its own person" historically and religiously. For example, even though the Armenian Church was and is in the Oriental Orthodox Family, it did not accept St Severus of Antioch into its calendar (I think it has come to an agreement on this only recently). There were always many Chalcedonian Armenian Orthodox around and St Paissy Velichkovsky numbered Armenians among the ten cultural groups that made up his followers in the 18th century. It seems to me that the Armenians, although having Eastern Orthodox, Oriental Orthodox and Orthodox in union with Rome among its people, have always been more civilized than others when it came to respect towards each other. I always love hearing Armenians' respect for the Catholic Mekhitarists for example. And when that original dome collapsed it was re-designed by an Armenian Architect and rebuilt. That dome remains to this day. It seems Slavs and Armenians have made their influence felt on the Imperial City of New Rome. reply: Good point. I did not know about St. Paissy. reply: Generally this is true that we have a reputation for seeing our differences as complimentary rather than conflicting. Yet this openess and trust has hurt our Mother Church in Etchmiadzin over the centuries. The reason being that those she welcomed in sincerity and trust often betrayed that trust by plundering her faithful (viz. Latins and Protestants). Thus she is more guarded now. reply: You are quite right. 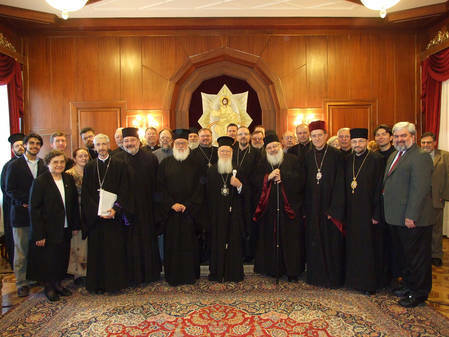 As one Armenian Orthodox Theologian/Historian, Archbishop Tiran Nersoyan, said, "Armenian Catholic religious orders, specially the Mkhit'arist monastic congregations in Venice and Vienna respectively, established early in the eighteenth century and formed of individual proselytes to Roman Catholicism, have rendered inestimable service to Armenian letters and scholarship, fostering and enriching the religious and cultural heritage of the Nation." I would also add that the term "Armenian" in Ukrainian/Rus' history has, unfortunately, often been synonymous with "heretic." This is seen as early as the Kyivan Caves Paterikon when an Armenian Christian entered the cell of one of the monks - the monk was irate as he felt his cell was "polluted" by the presence of an "heretic" and he chided the man for daring to cross his cell's threshold, and this during the Great Fast! However, there was always an Armenian Community in Western Ukraine and I grew up hearing about its many contributions to Ukrainian life. 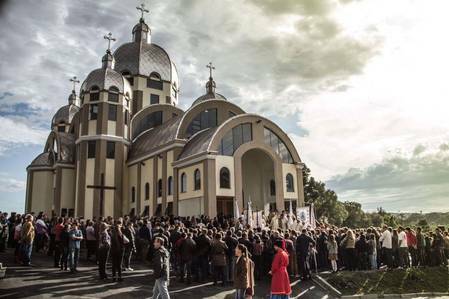 I am proud that our Catholic tradition in Ukraine includes three Churches, including the Armenian Church. "The cause of our running away from you is that you have been pulling down our churches, destroying our altars, smashing the signs of Christ, harassing our clergy, spreading slanders in a way that even the enemies of Christ would not do, even though we live close to them. Such behavior will not only fail to unify the divided, but it will divide those who are united. For human nature loves contrariness. And men are drawn to the execution of commands not so much by violence as by humilty and love." I thank God, that those days are gone and our two Churches are realizing the closeness in faith and tradition which we share. 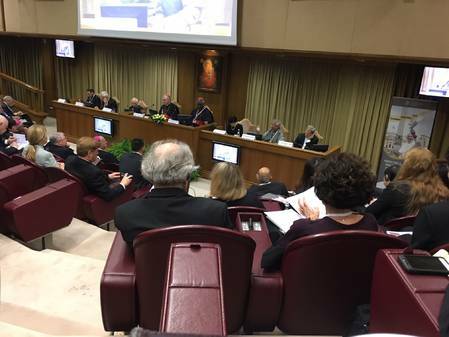 True unity, as St. Shnorhali said, will be based on humility and love. It appears I erred in reference to St. Photios and the Armenian Liturgical Calendar. I consulted my team of Armenian Liturgical Experts and Theologians (i.o.w. an Armenian Church forum) and found that we commemorate another St. Photios. As Mor Ephrem was arguing, he is pre-schism and pre-Chalcedonian. I thought I should post this inorder to avoid any further spread of my error. p.s. But this doesn't mean I can't recognize his sanctity ! 1. Phocas (Pogasoo hayrabedin) [Oct 6] - he was the Bishop of Sinope and was martyred in 117 AD -- in 2003 he is commemorated with St. Irenaeus. 2. Photinus [July 7] - martyr from Nicomedia 288-303AD [nephew of Anectus - also martyred] remember, the great majority of saints in the calendar are from the first 4 centuries. It appears I erred in reference to St. Photios and the Armenian Liturgical Calendar. I consulted my team of expert Armenian Liturgical Experts and Theologians (i.o.w. an Armenian Church forum) and found that we commemorate another St. Photios. As Mor Ephrem was arguing, he is pre-schism and pre-Chalcedonian. I thought I should post this inorder to avoid any further spread of my error. But St Photios the Patriarch had Armenian background in his lineage too! As do I, as it has turned out . . . This is a real shocker Alex! Does this mean you have monophysite blood running through your diophysite veins! 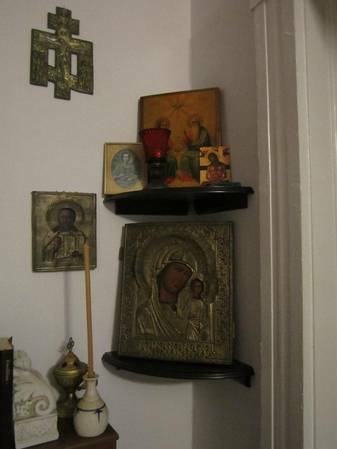 Anyways, I did not deny the sanctity of St. Photios or your own for that matter. All I said was that he was not commemorated on our calendar. Well, I'll have you know that I have been declared an "Honorary Miaphysite" online by no less than Catholicos Mor Ephrem, who was assisted, I believe, by Aklie and A Copt! The Armenian Apostolic Calendar, although belonging to the Oriental Orthodox family of Churches, also did not have (perhaps it does now? )the commemoration of St Severus of Antioch. There was some doubt cast on his Orthodoxy by some Armenian theologians and only know has that been cleared up. Also, the Armenian Apostolic Calendar, at one time, actually listed "St Thomas of Canterbury, Martyr" and Western missionaries were shocked to have found local veneration of this western Saint in Armenia! God bless the Armenians, I say!